Perfectly sized for day rides, the CL-1060-ST Sport Touring Tail/Seat pack easily mounts to most tail sections and seats, using self-adjusting hooks attached to the bag with soft ties connecting it to your bike. Made from top quality Tri-Max ballistic nylon with Fibertech accents the Sport Touring Tail/Seat pack maintains it's shape, has reflective piping, and a lined interior with adjustable compartment divider for better storage options. Reverse coil zippers helps keep out dust and dirt, keeping zippers working smoothly and the Lockable Hi-density rubber zipper pulls operate easily with gloves. Also features a fully expandable top section, a mesh pocket and organizer under the lid, a flush mount reflective carry handle, protective material to prevent slipping or marking, and a shoulder strap which converts into convenient backpack straps. 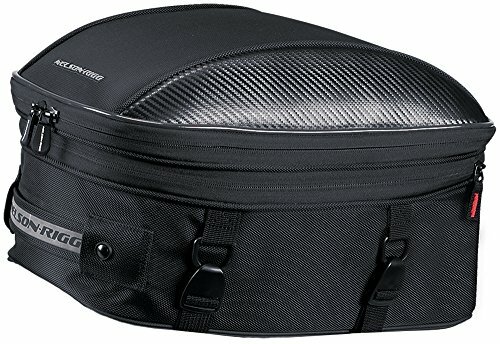 Main compartment is fully expandable and can hold a full face helmet, measuring: 14"L x 12"W x 9"H Standard / 14"L x 12"W x 12"H Expanded, holding 24.78 Liters / 33.04 Liters expanded, Includes a Lifetime "No Hassle" warranty and removable rain cover. If you have any questions about this product by Nelson-Rigg, contact us by completing and submitting the form below. If you are looking for a specif part number, please include it with your message.